There’s a famous saying that ‘Engineering is the art or science of making practical’. The upcoming winter holidays are the perfect opportunity for engineering students to get practical experience. All engineering students need to strike up the perfect balance of theoretical and practical knowledge. Time off in the holidays, utilized to acquire specific practical skills, will be helpful to revive the fun and curiosity in engineering. Skyfi Labs provides engineering students across India a chance to set their education into action with Winter Training and Internship programs. The programs are modeled to aid students in getting industry-ready. That is, to acquire the practical know-hows critical for professional success. By working on unique projects and putting all their ideas and imagination into it, students gain insights on how the theories they learn are applied in real-life. 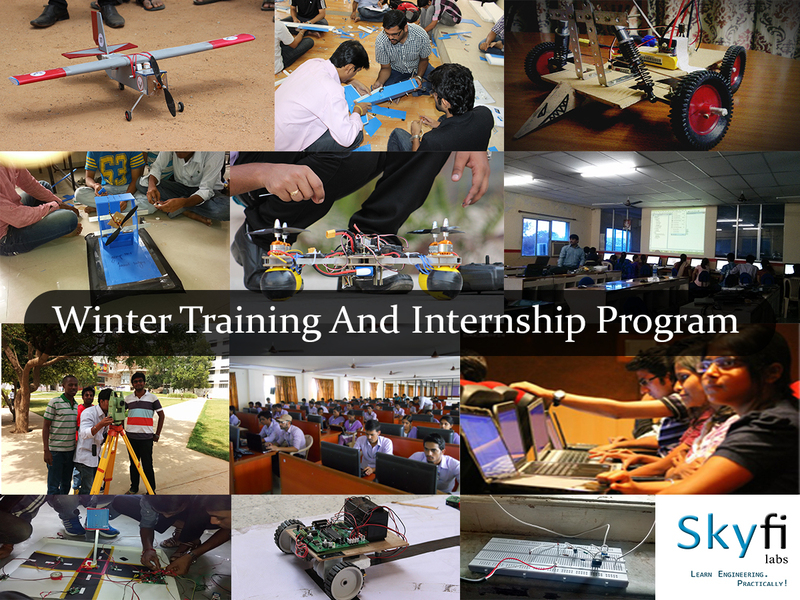 The upcoming Winter Training and Internship Program includes training on multiple technologies - technologies that will spark renewed thinking in budding engineering minds. The Winter Training and Internship Programs are happening across 12 cities in India and offer a choice of 13 basic projects to choose from. Training will be of 6 days with 6 hours per day of practical experience. Students have enough time to explore further innovative ideas. In the 6 hours of a day, students will be guided to work on several technologies involving hardware and software based on the basic projects they chose to do. Students have more options to choose from this time around. We have introduced programs in novel technologies like 3D printing, Automobile engineering, Smart energy systems, Surveying using Total Station and Transportation Engineering. The most beautiful part of Engineering is that we discover and learn things on our own. In fact, experimentation and knowledge gained by self-study are the best way to extend engineering knowledge. Winter training participants can utilize the knowledge and tools (both hardware and software) and make use of the remaining time to explore on their own. The students will be sufficiently guided for their endeavors. We also have an open book online exam (an exam where students can refer to books/ notes) so that students can assess the learning gained during this period. The exams are created to measure the practical/ application skills of the students and not their memory. So students are free from the pressure of memorizing text books like they normally do in their academic courses. The purpose of the exam is not to judge the students but to give them an opportunity to measure how much progress they have made during the program. It also helps the students to quantify the learning and mention their scores in their resumes to support their achievement instead of just mentioning that they participated in a training program.